Over 15 years ago, Patrol Officer Martin Schrampfer came from Menasha, WI to learn more about what National Police Week was all about. After attending the Candlelight Vigil for the first time, Martin felt the important role the National Law Enforcement Officers Memorial plays in the lives of law enforcement officers and their families. That’s when he decided to become a Law Enforcement Ambassador. “As I watched the survivors come off the buses to attend the Vigil I knew I needed to do something because it was the right thing to do,” he said. After returning to the Vigil twice since that day 15 years ago, Martin noticed all the different car/motorcycle tags on vehicles he saw parked around the Memorial. That led to an idea: Wisconsin needs to spread the word about the Memorial Fund with a state license tag. Everyone has a thought from time to time that something needs to be done, but how many people take action? Martin did. Once returning from Police Week, he reached out to his State Representative Dean Kaufert, a son of a Neenah police officer, to get a Memorial Fund license tag in Wisconsin. Representative Kaufert agreed that Wisconsin needed a tag to not only remind residents about the sacrifice that law enforcement officers make each day but to let others know about the National Memorial in Washington, DC. Despite two failed efforts for the bill to become law, Ambassador Schrampfer pushed Representative Kaufert to try a third and final time this session. With the support of State Senator Mike Ellis, this time the bill made it to the Wisconsin State Senate and was passed. 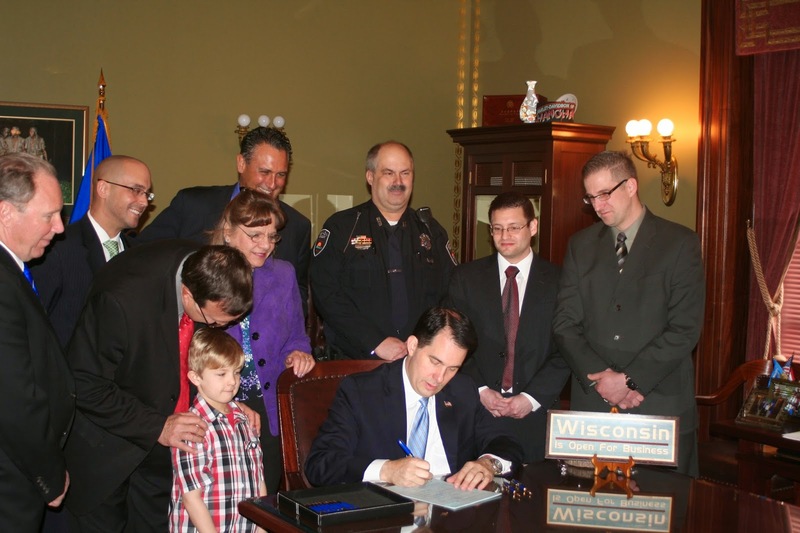 On April 16, Ambassador Schrampfer watched as Governor Scott Walker signed bill AB208 into law. Ambassador Schrampfer’s idea became reality thanks to support from the Chief at the Menasha Police Department and so many others throughout the state. Now that that the bill has been signed it will take 6 to 10 months for production to begin. Stay tuned for more information. Thank you to all our friends and supporters for another highly successful Police Week! This year, we honored the addition of 286 American Law Enforcement heroes to the National Law Enforcement Officers Memorial. Pre-Police Week events began on Sunday, May 4 at the 23rd Annual Correctional Officers Wreath Laying Ceremony. During this event, the Metropolitan Washington Council of Governments Corrections Chiefs Committee gathered at the National Law Enforcement Officers Memorial to honor correctional officers who made the ultimate sacrifice. Events continued on Tuesday, May 6 during the 20th Annual Blue Mass. During the event, public safety and law enforcement officers from the Washington, DC Metropolitan area gathered at St.Patrick’s Catholic Church to pray for a mass to honor those who serve in law enforcement and fire safety, and remember the fallen. On Friday, May 9, The Metropolitan Police Department (MPD) of Washington, DC, the Fraternal Order of Police DC Lodge #1, and the DC Chapter of Concerns of Police Survivors hosted the 35th Annual Washington Area Police Memorial Service at MPD’s Headquarters in downtown DC with Jennifer Donelan of ABC/WILA-TV, as master of ceremonies. Police Week activities officially kicked off when the 19th Annual Law Ride rode into town on Sunday, May 11. Hundreds of motorcyclists cruised from RFK Stadium past the U.S. Capitol, down Pennsylvania Avenue, and up 5th Street on their way to the Memorial. Police Week 2014 really geared up on Monday, May 12 when the 18th Annual Police Unity Tour arrived at the Memorial. It was a sight to see when 1,800 riders made their way through the Memorial's Pathways of Remembrance. After a brief ceremony, the Police Unity Tour presented the Memorial Fund's Chairman & CEO Craig Floyd with a check for $1.91 MILLION dollars, their biggest donation yet to the Memorial Fund! Tuesday, May 13 marked the biggest and most important day during Police Week, the night of the 26th Annual Candlelight Vigil. Despite a rain delay, thousands gathered at the Memorial to raise their candles high in honor of the 20,267 officers on the Memorial. Police Week events didn't after the Candlelight Vigil. On Wednesday, May 14 the runners participating in the 18th Annual Law Enforcement Memorial Run completed their journey from Philadelphia, PA to the Memorial in honor of fallen officers from Pennsylvania, New Jersey, Delaware and Maryland. Also on the Wednesday the 14th, the 20th Annual Emerald Society and Pipeband March and Service made their way to the Memorial. During the event, the Emerald Society, an organization of American police officers or fire fighters of Irish heritage, remembered all law enforcement officers killed in the line of duty, in particular officers of Gaelic descent. Emerald Societies from all over the US participated in the march. Police Week events also included the 33rd Annual National Peace Officers' Memorial Day Services at the U.S. Capitol on Thursday, May 15. After the ceremony, the Fraternal Order of Police and Fraternal Order of Police Auxillary brought their wreath to the Memorial, where Honor Guard teams from all over the U.S. stood watch over it until midnight. In 1962, President Kennedy proclaimed May 15th as National Peace Officers Memorial Day and the calendar week in which May 15th falls, as National Police Week determining the dates for National Police Week 2014 — Sunday, May 11th through Saturday, May 17th. At the conclusion of the 33rd Annual National Peace Officers’ Memorial Service at the U.S. Capitol, leaders of the Fraternal Order of Police, the FOP Auxiliary, Concerns of Police Survivors and the Memorial Fund brought the wreath from the Capitol to the Memorial to remain under the watch of honor guards from all over the country for the rest of the evening. At midnight, a lone piper walked through the Memorial, and the flags were returned to full staff, signaling the end of Peace Officers Memorial Day. 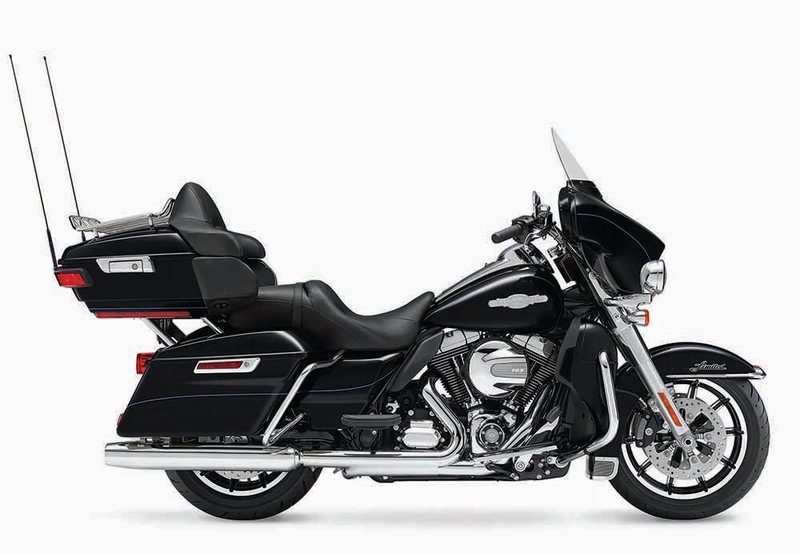 The National Law Enforcement Officer’s Memorial Fund would like to extend our congratulations to the winner of this year’s Harley Davidson raffle, Ms. Karen R.! Karen has been buying 4 tickets each year, and she said she thought this was her year! Karen is a long time supporter of the Memorial Fund as her brother is a Grand Prairie, Texas Police Sergeant. We greatly appreciate her support and send her our well wishes for her new ride! The Emerald Society, an organization of American police officers or fire fighters of Irish heritage, held the 20th Annual Emerald Society and Pipeband March and Service on Wednesday, May 14th. The service remembered all law enforcement officers killed in the line of duty, in particular officers of Gaelic descent, and featured numerous musical tributes. Last night, the nation paused to formally dedicate the names of 286 fallen law enforcement heroes, added to the National Law Enforcement Officers Memorial in 2013. Of the 286 names, 100 were officers killed in the line of duty during 2013 and 186 were names of officers previously undiscovered. Secretary of Homeland Security Jeh Johnson, and Madeline Neumann, National President of Concerns of Police Survivors (C.O.P.S. ), also participated in the annual tribute to fallen officers, a special part of the National Police Week observance in the nation’s capital. The evening’s program also featured musical tributes and a special recognition of survivors of fallen officers, as well as some dignitaries and guests, including Senator Lisa Murkowski representing the state of Alaska. The National Law Enforcement Officers Memorial Fund also partnered with Clear Channel Outdoor to raise awareness across the country to honor these fallen officers, as well as raise awareness about the annual Candlelight Vigil and United By Light events and virtual candle wall. And for the sixth year in a row, USA Today has printed a quarter page ad in honor of the 100 officers who died in 2013. The national monument now contains the names of 20,267 fallen law enforcement officers—from all 50 states; the District of Columbia; U.S. territories; federal law enforcement, corrections, railroad and military police agencies—who have died in the performance of duty throughout U.S. history, dating back to the first known officer death in 1791. Special thanks to Officer.com for providing a free webcast of last night's services. The 18th Annual Law Enforcement Memorial Run made its way to the National Law Enforcement Officer's Memorial this afternoon. Each year runners make the journey from Philadelphia, Pennsylvania to Washington DC to honor fallen officers from Pennsylvania, New Jersey, Delaware and Maryland. The run began 18 years ago with just two participants. Over time, the Law Enforcement Memorial Run has evolved into a group of over eighty participants including officers, supporters and survivors. In addition to the main group, hundred of extra runners join in during various legs of the trip. The run made several stops along the way to honor those law enforcement officers who have made the ultimate sacrifice. During the post-run ceremony, the group honored the families of fallen Officer William J. McCarthy, IV, Shenango Township (PA) Police Department, Officer Daniel "J.J." Lomax, Forest City Borough (PA) Department, and Officer Jason L. Schneider, Baltimore County (MD) Police Department. Each family was presented a plaque by James Harrity, Pennsylvania State Fraternal Order of Police. For the sixth year in a row, the company’s flagship newspaper, USA Today, has donated a quarter-page ad paying tribute to officers killed in the line of duty. 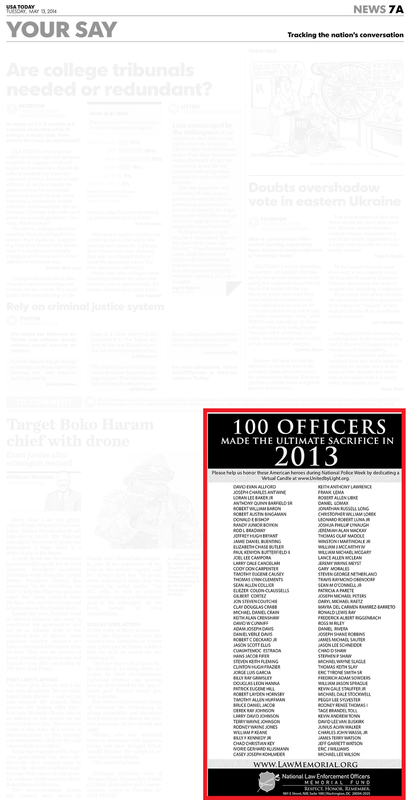 The ad, which appeared on page 7A of the May 13th edition, lists the names of all 100 officers who died in law enforcement service during 2013. And it reminds the family members, loved ones and colleagues of the fallen that a grateful nation will always remember these brave men and women. Shortly after 2 pm today, nearly 1,800 members of the Police Unity Tour completed their long journey to Washington, DC. Participants traveled hundreds of miles the past three days—from six spokes in East Hanover (NJ), Franklin Township (NJ), Millville (NJ), Portsmouth (VA), Richmond (VA), and Philadelphia (PA) to the National Law Enforcement Officers Memorial. After all riders had entered the Memorial, a brief ceremony was held, and Florham Park (NJ) Chief Patrick Montuore, founder of the Police Unity Tour, presented a check for $1.91 million to Craig W. Floyd, Chairman & CEO of the NLEOMF—the highest amount raised in the history of the Police Unity Tour. We thank all the members of the Police Unity Tour, who worked tirelessly to ensure the service and sacrifice of America's law enforcement heroes are forever remembered. Their generosity, commitment and unity are vital to honoring all 20,267 officers killed in the line of duty. This Mother’s Day, law enforcement officers and motorcycle enthusiasts gathered at RFK Stadium in Washington, DC to prepare for the 19th Annual LawRide to the National Law Enforcement Officers Memorial. Hundreds of motorcyclists cruised past the U.S. Capitol, down Pennsylvania Avenue, and up 5th Street on their way to the Memorial. The Metropolitan Police Department (MPD) of Washington, DC, the Fraternal Order of Police DC Lodge #1, and the DC Chapter of Concerns of Police Survivors hosted the 35th Annual Washington Area Police Memorial Service at MPD’s Headquarters in downtown DC with Jennifer Donelan of ABC/WILA-TV, as master of ceremonies. This annual service recognizes the work of all DC Metro area law enforcement officers. Special recognition was given to those who made the ultimate sacrifice in 2013, including Special Agent Christopher William Lorek, Special Agent Stephen Shaw, Special Agent Sang Jin, Officer Jason Schenider, and K-9 "Maxo". Following the presentation of colors and the national anthem, introductory remarks were given by District of Columbia Police Chief Cathy L. Lanier, followed by remarks from District of Columbia Mayor Vincent C. Gray and guest speaker Stacia A. Hylton, Director of the United States Marshals Service. Representatives from the Federal Bureau of Investigation, Baltimore County Police Department, and United States Secret Service spoke about their officers lost in the past year, which was followed by a solemn roll call of fallen heroes from the DC Metro area. The names of the four officers honored at the service today will be dedicated on the walls of the National Law Enforcement Officers Memorial at the 26th Annual Candlelight Vigil this Sunday, May 13 at 8:00 pm, along with 286 other officers who have made the ultimate sacrifice. In 1962 President John F. Kennedy proclaimed May15 as National Peace Officers Memorial Day and the calendar week in which May 15 falls as National Police Week. Established by a joint resolution of Congress, National Police Week pays special recognition to those law enforcement officers who have lost their lives in the line of duty for the safety and protection of others. I believe the highest tribute I can pay these heroes is to study the circumstances that brought them to the memorial and learn from them so history is not repeated. … I am convinced that the three acres that comprise the NLEOM hold the most value—law enforcement officers first must pay the ultimate price to be inscribed upon these memorial walls. Today, public safety and law enforcement officers from the Washington, DC Metropolitan area gathered at St.Patrick’s Catholic Church to pray for a mass to honor those who serve in law enforcement and fire safety, and remember the fallen. The Mass included an honor guard, bagpipers, and the solemn playing of "Taps" in memory of those who gave their lives in the past year. Before Mass, hundreds of law enforcement officers and public safety officials gather outside for the solemn processional into St. Patrick's. Units from federal, state, and local jurisdictions gather in formation to pass under a huge American flag proudly hung over the street by two fire ladder trucks. Also gathered outside are officers on horseback, as well as pipe and drum corps units. The principal celebrant and homilist for the Blue Mass was His Eminence Donald Cardinal Wuerl, Archbishop of Washington. On Monday, May 5th, Memorial Fund Chairman & CEO Craig Floyd attended the Howard County Police Memorial Service. While there, he honored seven courageous individuals—Charles Weber, Frank Miller, Randloph Brightwell, Ted Wolf, Roger Cassell Jr., Scott Wheeler and Shaft Hunter—all of whom died in the performance of duty in Howard County. During his speech, Mr. Floyd thanked the Howard County officers for their service during the shooting incident at The Mall in Columbia on January 25th of this year, wherein a lone gunman shot and killed two people. "That incident was an extreme example of what officers must do on a daily basis—put your lives at risk for the safety and protection of others," he said. "Your response on January 25, not knowing what dangers might be waiting when you entered that Mall, was one of law enforcement’s finest moments. As frightened citizens rushed out of the Mall to safety, Howard County law enforcement professionals rushed in." After Mr. Floyd's speech, Howard county presented the Memorial Fund with a check for $16,500. Thank you to the Howard County Police Department for their generous gift to the Memorial Fund. Yesterday, the Metropolitan Washington Council of Governments Corrections Chiefs Committee gathered at the National Law Enforcement Officers Memorial to honor correctional officers who have made the ultimate sacrifice.